half a day. 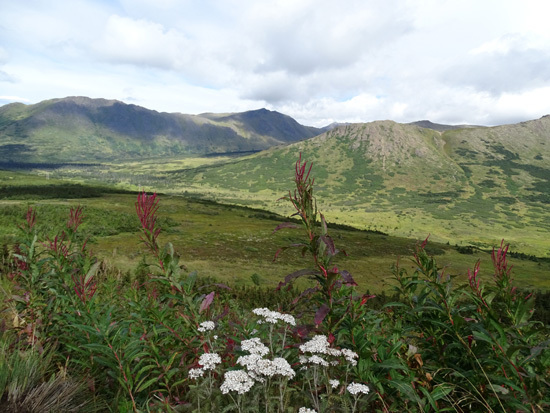 At the top, the views are as fine as any in the Chugach front range . 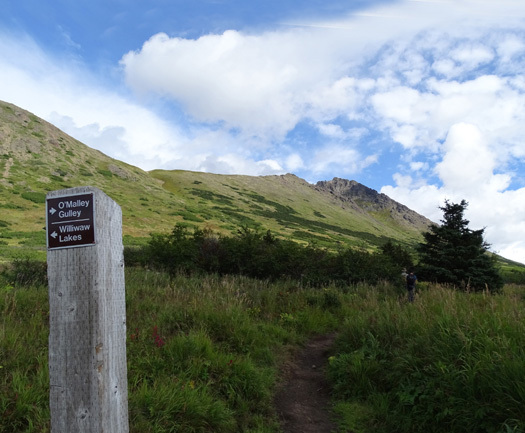 . ."
As we're running out of time in Anchorage, I've been focusing on what remaining trails I want to do and came up with an interesting combination of three different ones today from the Glen Alps trailhead. 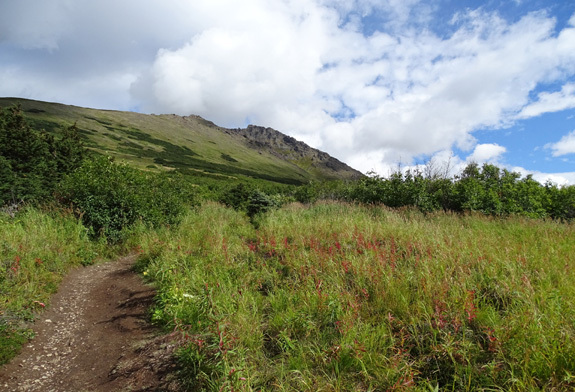 All are part of the well-used Anchorage "Hillside" system of trails in Chugach State Park. 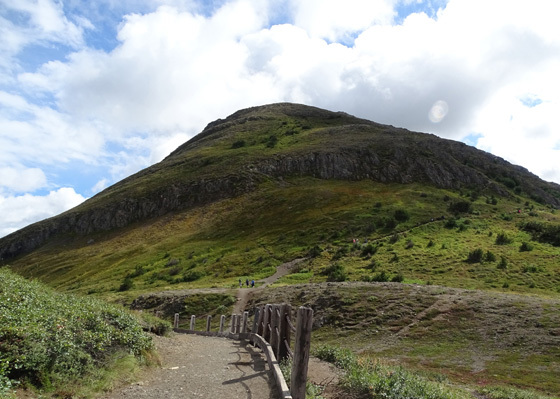 Two I've done previously -- the Blueberry Loop, which accesses uber-popular Flattop Mountain -- and the short coastal overlook trail right above the main parking area. 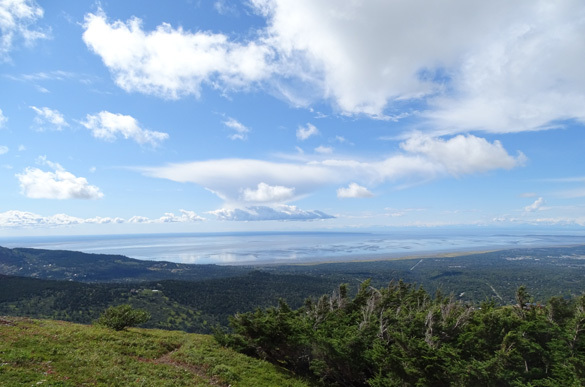 near distance; Anchorage, Cook Inlet, and Alaska Range (under clouds) in far distance. The third part of the hike was mostly new to me. I added a long out-and-back up to and over the ridge between Little O'Malley and O'Malley Peaks. 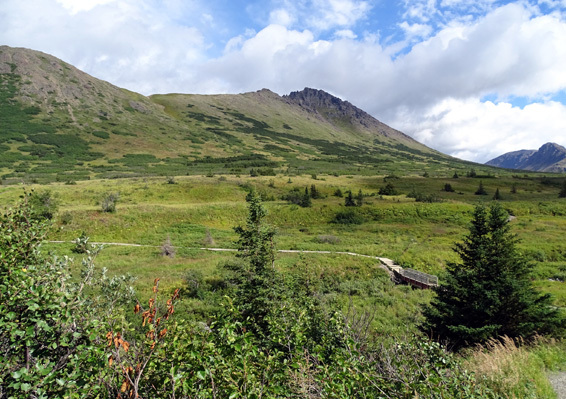 I followed the rocky trail through the Ballpark plateau on the eastern side of the ridge and what's called the O'Malley Gully (misspelled "gulley" on the trail sign) to an overlook of the Williwaw Lakes and trail I hiked several days ago. 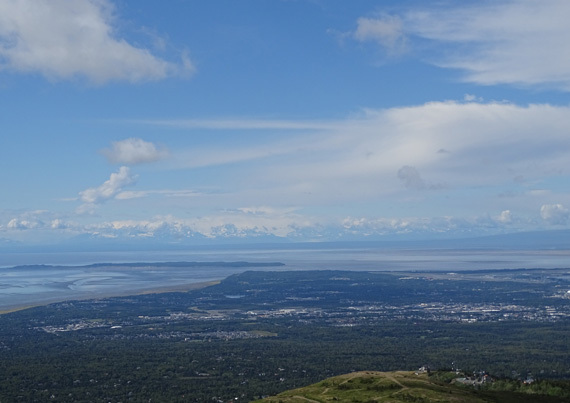 Along the way I got some superb views of Turnagain Arm, Cook Inlet, the city of Anchorage, the Williwaw Valley, and three alpine lakes I haven't seen before. If there hadn't been so many clouds, I could have also seen Denali and the rest of the Alaska Range to the north and the volcanic peaks west of Cook Inlet. Alas, it was too cloudy over those ranges to see them. 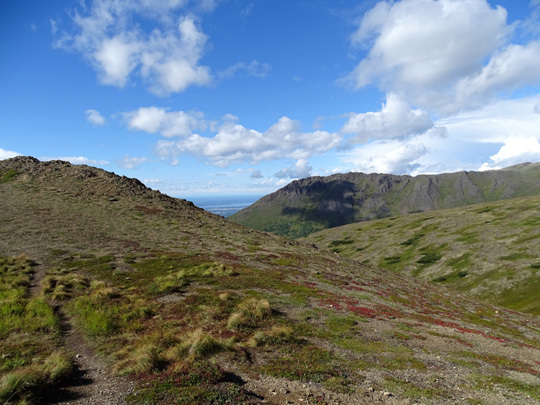 Otherwise, it was perfect weather for a hike in the sub-alpine and alpine area above the Anchorage Bowl. The three days between this hike and my last one to Williwaw Lakes have been mostly overcast, with high threats of rain each day but probably no more than an inch accumulation during that whole time. Instead of any long hikes or bike rides Jim and I opted to take the dogs on shorter walks and bike rides, run errands, do more trip planning for this fall and winter, work on photos and the website, and just relax. My arm is healing well after that nasty fall coming down from the Harding Icefield on August 7. I'm surprised the large skin flap appears to be growing normally and looks much better than I expected. Jim took out the stitches in the elbow yesterday. I don't need bandages on either of those two bad spots during the day but I still keep them covered overnight so I don't rub the scabs off when I'm moving around in my sleep. We expected to be inside again for most of today because NOAA predicted a whopping 100% chance of rain. We did get a few sprinkles in the morning but soon the sun was out and we began making outdoor plans. Temps ranged from 54 to 68 F.
In the morning Jim took Casey for a 5+ mile bike ride on base and let her swim in Ship Creek. He saw the mama moose and her twins nearby. Later he rode solo for about 10 miles. Time's a'wastin'. 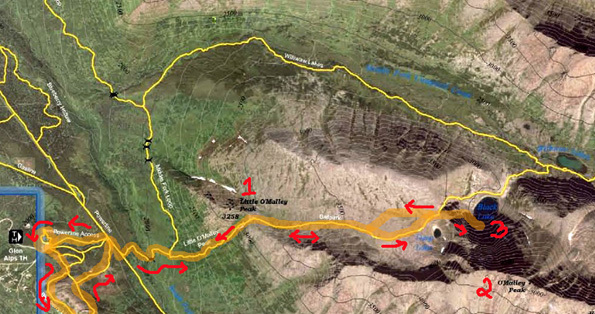 After lunch I decided to head to Glen Alps to do the loopy hike I described above. Glen Alps parking lot is at far left. Blueberry Loop is below that, the little overlook loop above it. #1 is Little O'Malley Peak, elev. 3,258 feet. I went over the ridge in a saddle a little below that. The "Ballpark" is the large tan area on the plateau east of and just below the O'Malley ridgeline. #2 is O'Malley Peak, elev. 5,184 feet. I turned around above Black Lake at #3. The other large curved yellow line to the north and east is the Williwaw Lakes Trail I did several days ago. You can see some of the Williwaw lakes on this map. I could see them from the overlook today but didn't go down the steep trail from the O'Malley ridge to them. X = start/finish at Glen Alps parking area. Flattop Mtn. is in the lower left corner. #1 = Little O'Malley Peak. 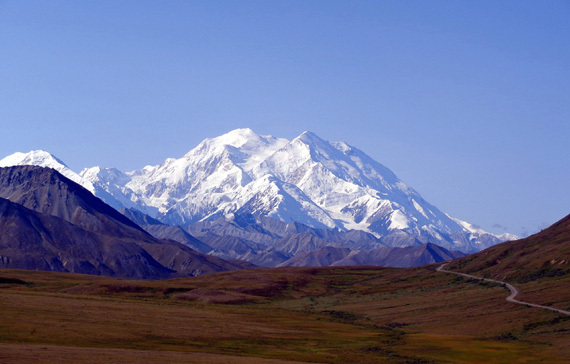 #2 = O'Malley Peak. 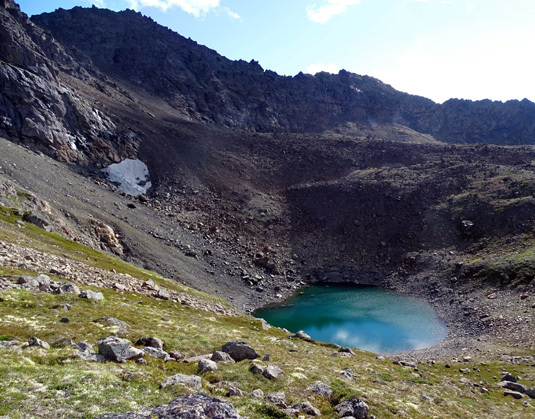 #3 = Black Lake, a high alpine lake I couldn't see from the Williwaw Valley several days ago. A couple of the Wllliwaw lakes are in the upper right corner. Total distance for all three trails was 8.72 miles. I didn't go all the way to the rocky peaks on either side of the ridge. I spent time at the overlook above Williwaw Lakes -- and saw two higher glacial ponds that I didn't see from the Williwaw Valley. That's where I turned around. There was also a little glacial pool below some melting snow high on O'Malley. I'll show photos of all three alpine pools later in this entry. 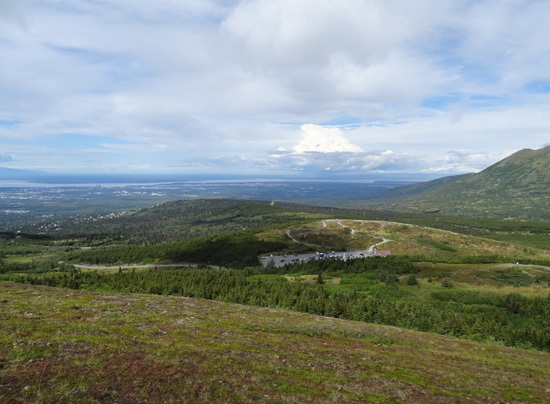 About 1/3 mile up this little mountain and around much of the loop there are very nice views of Anchorage, Cook Inlet, Turnagain Arm, nearby mountains in the Chugach Range, and more distant mountain ranges. Been there, done that a couple times so I didn't plan on that again today. Sharp O'Malley Peak is dead ahead. are in the valley. The distant valley is where I hiked up to Williwaw Lakes a few days ago. 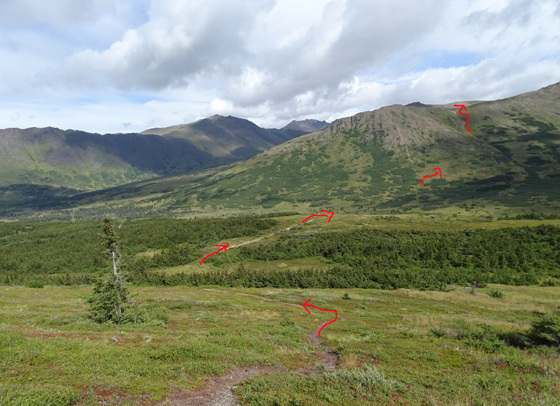 The arrows show the general direction I took up to the saddle on the south side of Little O'Malley Peak but they don't show where I dropped down into the valley to the Powerline and creek. 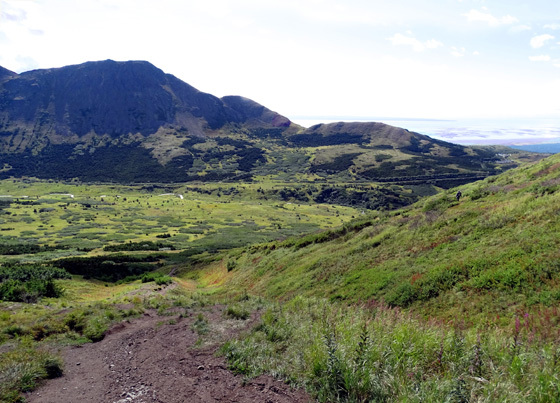 Looking south from the access trail; O'Malley is on the left, Flattop somewhere on the right. I walked south on Powerline a bit until I reached the trailhead for the Middle Fork Loop that I took to access Williwaw Lakes a few days ago. 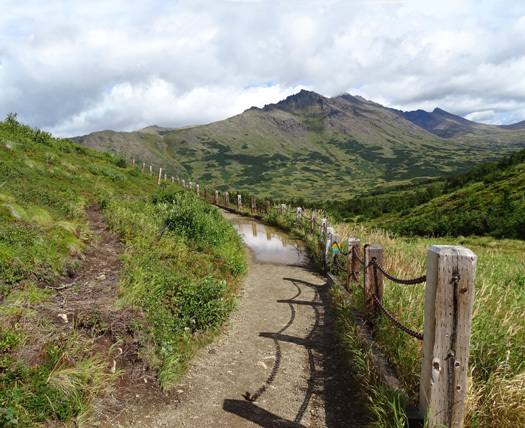 This trail also takes hikers to the Little O'Malley trailhead I was aiming for today. Middle Fork Loop goes left and the Powerline is on the right. This is where I (or someone else) surprised a large black bear on Friday! I don't know if he was the one that killed the moose or not. 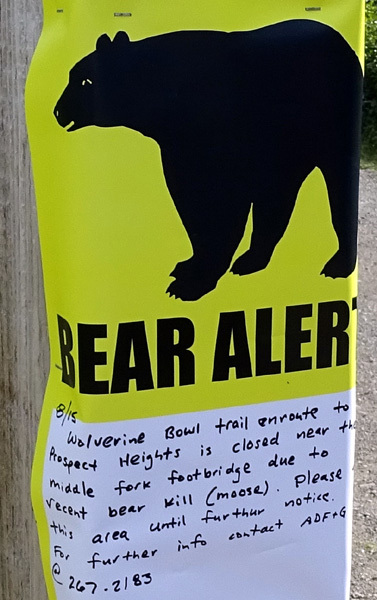 There are plenty of bears around here, so it could have been any one of them. The sign was dated the day after I came through here from my Williwaw hike. I read the sign carefully to make sure the trail I wanted to use today wasn't closed. It wasn't, so I proceeded on, cautiously. 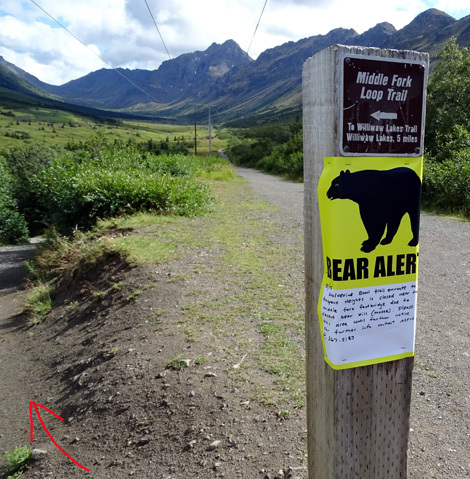 I had my bear spray and called out "Hey, bear!" for the next half mile when no one else was around. After I got to the Little O'Malley Trail I could almost always see someone either ahead of or behind me so I stopped yelling. 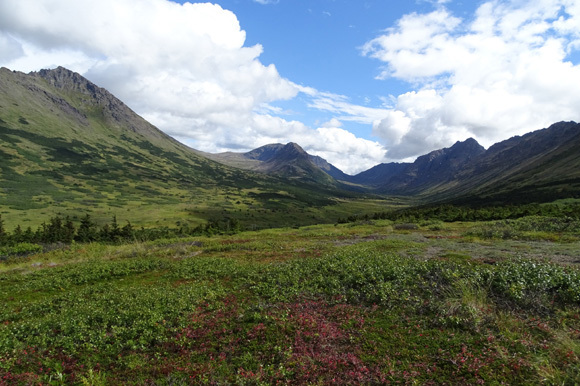 And once in the tundra I could see all around me; there were no signs of bears up there. Two people turned onto the trail just ahead of me, so I had someone to follow up to the ridge and beyond. I reached the trailhead for the Little O'Malley Trail AKA O'Malley Gully at 2.2 miles. If I'd gone more directly from one of the parking areas at Glen Alps it would have been only about a mile. 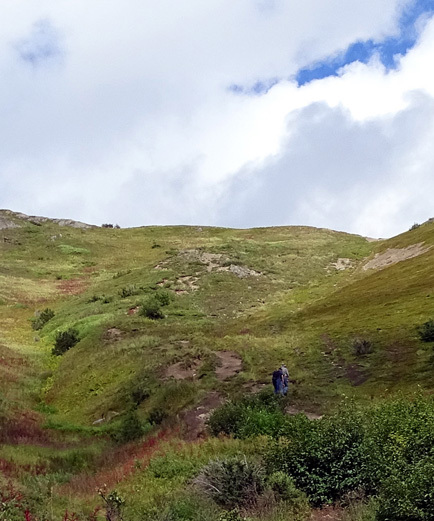 Arrow marks the saddle where the trail crosses the ridge. 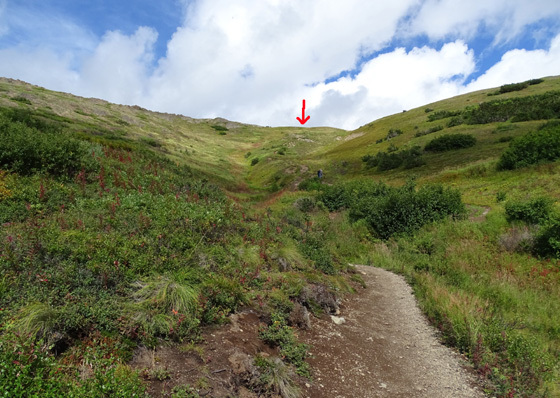 I was able to climb up to the ridge OK on the trail to the right of a dry stream but had to zig-zag back down later on the return because of my Granny Knees. I reached the saddle right at 3 miles into the hike. 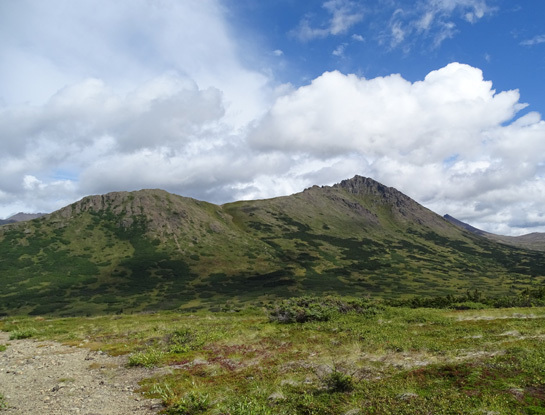 The jagged O'Malley ridge was on my right (south) and the more rounded Little O'Malley (3,258') was on my left. 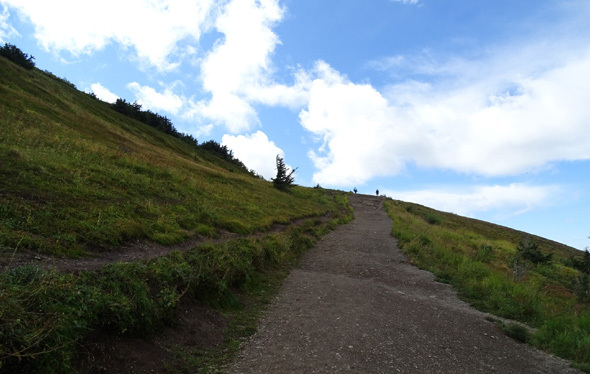 The elevation was about 3,130 feet there. 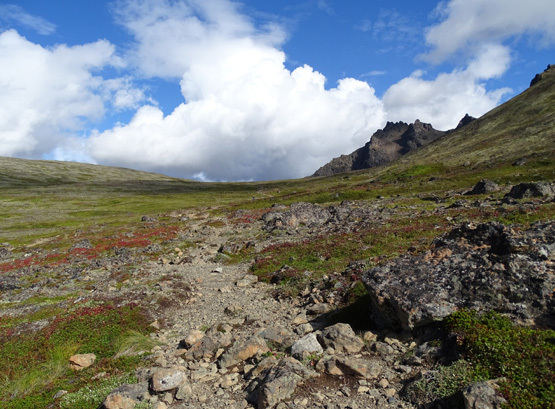 I continued to climb gradually up to 3,834 feet through the tundra to my turnaround point above Black Lake.